The recent arbitration over China's aggressive land grab in the South East Sea hasn't assuaged fears of a possible conflict in the area. The ruling, firmly rejected by the Asian superpower, came after an escalation of tensions with its neighbours and the US. In theory, China has no interest in an armed conflict, but that might be just what the Communist Party needs to shore up support in the face of economic stagnation. An international tribunal, backed by the United Nations, ruled last week that China's claims over the South Sea and its island chains are illegal, according to the International Convention on the Law of the Sea. 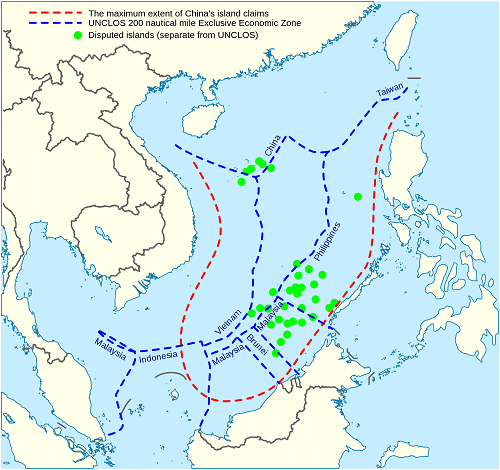 The nation’s “nine-dash line” lays claim to almost 90 percent of the South China Sea, extending 1,000 km from China and coming within less than 100 km of its neighbours' coasts. The US warned in February that China had deployed a surface-to-air missile system on a disputed island. In response, it dispatched a carrier strike group to patrol the area. In a show of defiance, China announced military exercises to be carried out during the week before the ruling. In the meantime, the U.S. Navy’s Task Force 70 moved to the South China Sea “to maintain the seas open for all to use”, in the words of its commander, Rear-Admiral John D. Alexander. Other countries are involved in the crisis. Vietnam, the Philippines and the rest of China's neighbours fear the expansionist policy, according to Statista. In March, Japan approved new military legislation that authorises its Self Defence Forces to engage in military actions. Sociologist Salvatore Babones notes that, “China’s true interest in the South China Sea has much more to do with history and politics than with oil and security.” Fanning the flames of national pride and focusing the Chinese people’s attention on a territorial conflict could be the perfect distraction. Following the adverse ruling, Beijing has refused to cede any ground. In fact, it has announced military drills in the area and plans to build nuclear power stations on the disputed islands. It may not want to start a war, but these defiant actions indicate negotiation is off the table.